Seasonal Yoga & Nutrition Day Retreat for Spring! Our Seasonal Yoga & Nutrition Day Retreat for Spring is a energy lifting day filled with warmth and wellness just for you. Refresh, renew, recharge. Our time together will be a spring-cleaning for mind, body and spirit. It is designed to re-energise and re-balance your body and mind through specially designed vinyasa flow yoga, pranayama and meditation techniques. It will include a combination of restorative and dynamic classes that focus on the powerful Spring energy of the Wood Element within and around us. This involves working with the detoxifying and planning ahead processes of our Liver and Gallbladder with plenty of information shared about how we can support, strengthen and heal our bodies though seasonal living and yoga. Seasonal Yoga is a unique style of yoga studied in depth by both of us where we connect familiar postures with the ancient knowledge of the 5-Element Theory from Traditional Chinese Medicine. This powerful combination brings about a sense of balance as well as restoring your body & mind towards your highest energetic potential. As well as yoga, we will learn about the best foods to eat to promote good health, how the body’s own detox system works and how to strengthen our immune system at this time of the year. Seasonal foraging tips and cookery workshop by local artisan producer, Luscious Lucy Cornwall, is geared especially towards rejuvenation in Spring. In addition we will provide seasonal information about our bodies, lifestyle and nutritional tips as well as cooking you a tasty and healthy organic lunch and snacks. If you have any dietary requirements, please inform us upon booking. 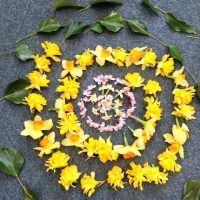 These retreats are a fantastic and fun way to learn more about the Seasons and how you can become more in tune with nature, helping to create a stronger, more energised and happy YOU! Workshops and classes are held at our inspiring yoga studio, enjoying stunning views over the sea at Fistral Beach in Newquay, Cornwall. Please ring or email if you have any questions or if you would like to book your place. As this is an out of house retreat, we are happy to recommend nearby accommodation to suit your budget if you don’t live locally. Spaces are limited, book today.